Florida Arbitration Clauses in Florida Wills and Trusts: Can You Force Arbitration on Heirs and Beneficiaries? Arbitration of controversies as an alternative to a Florida courthouse trial is happening more and more often, in more and more kinds of disputes. Often, these arbitrations are binding — and more and more often, consumers are discovering that they have no choice but to arbitrate their claim because they have waived their right to proceed with a traditional lawsuit as part of a contract they signed. Forced arbitration in consumer contracts is a very controversial reality today, in Florida and across the country. However, many Floridians may not be aware that arbitration has been approved by the Florida Legislature as a method of alternative dispute resolution that someone here in Florida can impose upon their heirs or beneficiaries via language in a Florida trust or a Last Will and Testament. 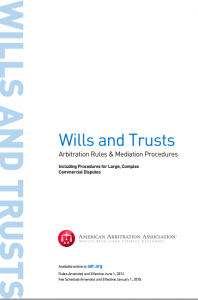 Since 2007, Florida Statute 731.401 (”Arbitration of disputes”) has been on the books to provide that option to someone writing or amending their will as well as someone creating a trust under Florida law. This is done by inserting specific language into the Will or the Trust that provides two things at the minimum: (1) that arbitration between those at loggerheads over an issue will be required as the place to resolve their differences and (2) that a certain set of rules will control this arbitration proceeding. In Florida, “voluntary binding arbitration” rules are set out in Florida Statute 44.104. These can be referenced if they are acceptable to the person making the will or creating the trust. (2) … In the absence of an agreement, or if the agreement method fails or for any reason cannot be followed, the court, on application of a party, shall appoint one or more qualified arbitrators, or the trial resolution judge, as the case requires…. (3) The arbitrators or trial resolution judge shall be compensated by the parties according to their agreement…. (7) The chief arbitrator or trial resolution judge may administer oaths or affirmations and conduct the proceedings as the rules of court shall provide. At the request of any party, the chief arbitrator or trial resolution judge shall issue subpoenas for the attendance of witnesses and for the production of books, records, documents, and other evidence and may apply to the court for orders compelling attendance and production. Subpoenas shall be served and shall be enforceable in the manner provided by law…. (9) The Florida Evidence Code shall apply to all proceedings under this section. (a) Any alleged failure of the arbitrators to comply with the applicable rules of procedure or evidence. (b) Any alleged partiality or misconduct by an arbitrator prejudicing the rights of any party. (c) Whether the decision reaches a result contrary to the Constitution of the United States or of the State of Florida. In order to save the cost of court proceedings and promote the prompt and final resolution of any dispute regarding the interpretation of my will (or my trust) or the administration of my estate or any trust under my will (or my trust), I direct that any such dispute shall be settled by arbitration administered by the American Arbitration Association® under its AAA Wills and Trusts Arbitration Rules and Mediation Procedures then in effect. Nevertheless, the following matters shall not be arbitrable: questions regarding my competency, attempts to remove a fiduciary, or questions concerning the amount of bond of a fiduciary. The arbitrator(s) shall be a practicing lawyer licensed to practice law in the state whose laws govern my will (or my trust) and whose practice has been devoted primarily to wills and trusts for at least 10 years. The arbitrator(s) shall apply the substantive law (and the law of remedies, if applicable) of the state whose laws govern my will (or my trust). The arbitrator’s decision shall not be appealable to any court, but shall be final and binding on any and all persons who have or may have an interest in my estate or any trust under my will (or my trust), including unborn or incapacitated persons, such as minors or incompetents. Judgment on the arbitrator’s award may be entered in any court having jurisdiction thereof. An arbitration replaces a trial proceeding, and the rules needed for arbitration to be a viable alternative to standard litigation practices means that the arbitration’s rules must cover the same details and needs as the formal rules of procedure and rules of evidence that apply to Florida lawsuits. Accordingly, rules for an arbitration in a Florida will or trust will be complicated and lengthy. Often, the Florida will or trust will not itemize the rules governing the arbitration in the Will or Trust documentation language because it would be too cumbersome. It can be done, but it may not be the most efficient way to accomplish this task. Arbitration rules have been mulled over and itemized by organizations like the American Arbitration Association. It may be easier to adopt and reference these rules – and then itemize any specific changes to them within the arbitration provisions of the will or trust than to reinvent the wheel. The arbitrator may receive and consider the evidence of witnesses by affidavit, but shall give it only such weight as the arbitrator deems it entitled to after consideration of any objection made to its admission. If the parties agree or the arbitrator directs that documents or other evidence be submitted to the arbitrator after the hearing, the documents or other evidence shall be filed with the AAA for transmission to the arbitrator . All parties shall be afforded an opportunity to examine such documents or other evidence. Arbitration not only is surprising many consumers who have complaints about things like cell phone charges or home builder repairs (see our earlier post on forced consumer arbitration clauses), but binding arbitration can be a huge surprise to a family member who first discovers that the deceased has left instructions not only on who will be making the final call on the family disputes (i.e., naming the arbitrator) but also defining how the controversy will be presented. Additionally, it offers the opportunity to name someone as arbitrator who knows his of her stuff in a particular area. For example, a known expert in natural gas might serve well as an arbitrator in a dispute where the estate holds a large amount of natural gas rights. This expert would know more than the Florida judge, for example, if the traditional route were taken — as well as most other arbitrators out there. Still, the beneficiary may be shocked to learn that the arbitrator will make decisions based upon affidavit testimony, not leaving them the option to appear and give live testimony, to “tell their side of the story” face to face with the fact-finder. And, arbitration in will and trust matters may arguably prevent the full airing of complaints that both serves justice as well as providing emotional closure for the survivors. The reality is that more and more Florida wills and trusts are taking advantage of the opportunity provided by Florida Statute 731.401. Here, arbitration’s fluid structure means advocating your side of the argument can much more difficult than in a formal trial because its expedited rules make it harder to flesh out your facts and positions. This is one more example of how arbitration is becoming the new way that disputes are being settled these days, and why being represented by an experienced Florida arbitration lawyer is so important now.